This article is about the indoor facility. For the main 1980 Moscow Olympic stadium, see Luzhniki Stadium. "Olimpiisky" redirects here. For Olimpiysky in Kiev, see Olimpiysky National Sports Complex. For Olimpiyskiy in Donetsk, see RSC Olimpiyskiy. Olympic Stadium (Russian: Олимпийский стадион) (known locally as Olimpiyskiy) is an indoor arena, located in Moscow, Russia. It was built for the 1980 Summer Olympics and, divided into two separated halls, hosted the basketball and boxing events. A part of the "Olimpiyskiy Sports Complex", it makes up one architectural ensemble with another venue, constructed at the same time, the Swimming Pool. Its capacity is 80,000 people. and the stadium can hold up to 16,000 people for televised events. In May 2014, the Government of Moscow auctioned 65% of shares in the stadium that it previously controlled. Oil company ZAO Neftegazprod won the auction, paying ₽4,672 billion rubles (approximately €100 million euros). Sporting events held at the stadium have included the Davis Cup finals and the Kremlin Cup tennis tournament. It was the world's first indoor bandy arena, and has hosted the Bandy World Championships in 1989 (the first bandy world championship held indoors) and 2008. When smaller indoor sports are held at the venue, such as tennis or basketball, only a quarter of the floor space is used. Capacity in this configuration can vary between 10,000 and 16,000 people. The arena hosted the 1999 FIBA EuroStars game and the 2005 Euroleague Final Four. The arena hosted the Eurovision Song Contest 2009, the first time Russia hosted the competition. The 2013 European Artistic Gymnastics Championships were held in the stadium between 17–23 April 2013. 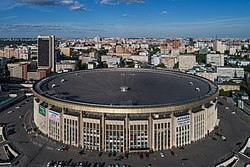 The venue hosted the World Boxing Super Series mens, cruiserweight final between Oleksandr Usyk and Murat Gassiev in front of 24,000 fans in attendance on July 21, 2018. Usyk won the fight comfortably, becoming the first fighter at cruiserweight to unify all four world title belts. Muhammad Ali's widow, Lonnie Ali, presented the Ali trophy to Usyk after the fight. On September 15, 2018, the stadium hosted the first ever UFC event in Russia, UFC Fight Night: Hunt vs. Oliynyk. SC Olympiyskiy is the largest indoor concert arena in Russia and one of the largest in Europe. Many international artists played concerts here as part of their world tours, such as 30 Seconds to Mars, Beyoncé, Britney Spears, Black Sabbath, Depeche Mode, Enrique Iglesias, George Michael, Imagine Dragons, Iron Maiden, Jamiroquai, Justin Bieber, Justin Timberlake, Kylie Minogue, Lady Gaga, Linkin Park, Madonna, Muse, Paul McCartney, Pink Floyd, Roger Waters, Rihanna, Robbie Williams, Whitney Houston and more. The venue hosted the Eurovision Song Contest 2009, the first time Russia hosted the competition. ^ 1980 Summer Olympics official report. Volume 2. Part 1. pp. 67-71. ^ Новым владельцем 65% акций СК "Олимпийский" стал "Нефтегазпрод" (in Russian). ITAR-TASS. 23 May 2014. ^ "Usyk routs Gassiev to become undisputed champ". ESPN.com. 21 July 2018. Retrieved 24 April 2019. Wikimedia Commons has media related to Olimpiysky Stadium.